This program will reconvene with the start of the new school year on MONDAY, AUGUST 27, 2018. 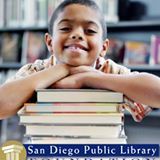 At the San Carlos Branch, DO YOUR HOMEWORK @ THE LIBRARY for Grades K-8, meets Mondays & Thursdays: 3:00-6:00; Tuesdays & Wednesdays: 3:00-7:00. Click on DYHL for times and participating Branches . This program does not meet on school holidays or during Thanksgiving, winter and spring breaks. Do Your Homework @ the Library provides a learning coordinator who supports students K-8 with curriculum-aligned resources, technology and community partnerships. The program uses Library equipment, staff, Wi-Fi access and digital resources, including the Help-Now online tutoring program. San Carlos Branch is looking for a few VOLUNTEERS to help with this program.